At The Graphene Box, we provide research centres, educational centres and R&D departments with high quality graphene for research at a low price. Created using the CVD (Carbon Vapour Deposition) method on the substrate. 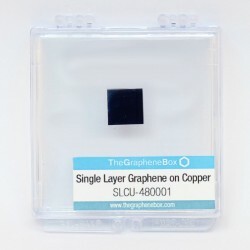 This type of graphene consists of a high quality single layer sheet. Due to their purity, these samples exhibit the highest conductivity within The Graphene Box range of products, which are usually intended for research laboratories and R&D departments that develop applications such as touchscreens, smart windows, flexible OLEDs, LCDs and solar panels. 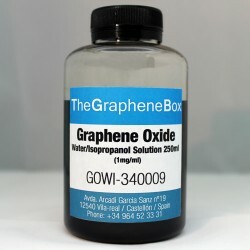 The Reduced Graphene Oxide Powder and the Graphene Oxide Powder are the ideal materials for forming conductive composites, solar panels, composites with a barrier effect, transparent electrodes, nanocomposites, thermal radiation coatings, capacitors, conductive inks and organic semi-conductive applications, among many others. 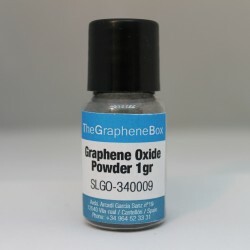 At The Graphene Box, we provide our clients with a series of Graphene Oxide Dispersions based of carbon, oxygen, and hydrogen in variable ratios, obtained by treating graphite with strong oxidizers, that improve thermophysical properties such as the thermal and electrical conductivity, thermal diffusion, viscosity and convection-transfer of heat of conventional fluids and materials. 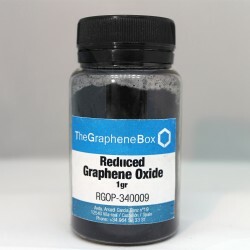 The Graphene Oxide Paper and Reduced Graphene Oxide Paper from The Graphene Box are a composite material from stacked graphene. This papers have a great acceptance in laboratories and research centers. These papers or membranes are obtained by slow evaporation or filtration of a Graphene Oxide Solution or a Reduced Graphene Oxide Solution. The Lab series There are 4 products. The Graphene Oxide Paper and Reduced Graphene Oxide Paper from The Graphene Box are composite materials from stacked graphene. The products have a great acceptance in laboratories and research centers. These papers or membranes are obtained by slow evaporation or filtration of a Graphene Oxide Solution or a Reduced Graphene Oxide Solution. The Graphene Papers have excepcional stiffness and strength, due to the intrinsic strength of the two-dimensional graphene backbone and to its interwoven layer structure which distributes loads.